Extensive knowledge of music theory isn’t required for most guitar players, but this isn’t true for jazz guitar players. Playing jazz, regardless of the instrument you play, almost requires a thorough understanding of melodic and harmonic theory. Jazz, by and large, is an improvised art form. A guitarist wishing to play jazz will find himself lost in the crowd if he doesn’t know one scale from another, how to build extended chords and use them in a progression, or how to play by ear. These disciplines and more are vital if you plan to play jazz guitar. 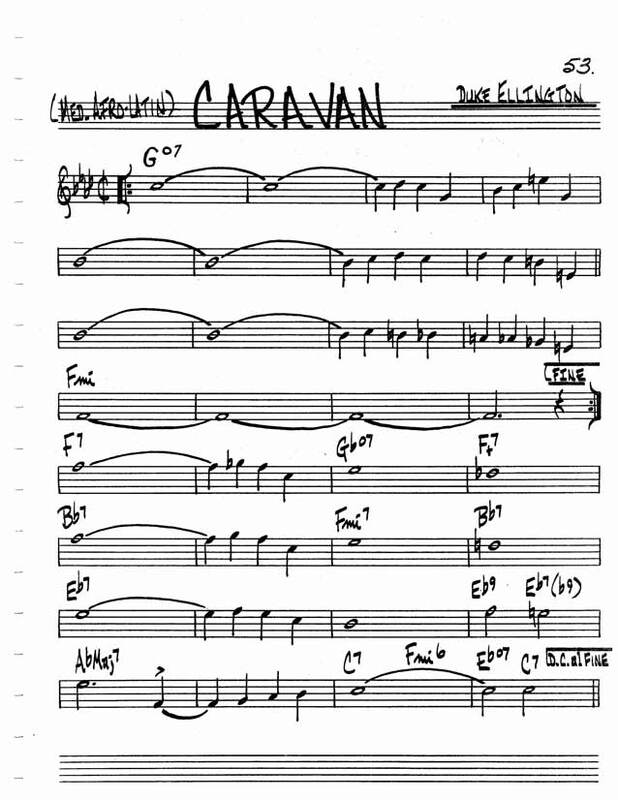 Let’s take a look at this jazz chart for Duke Ellington’s “Caravan.” This is what you’re likely to be presented with if you walk into a session to lay down some guitar work for a track or to play a gig at the local jazz club. You’ve got a chord progression, a key signature, and a bit of melody. The rhythm you play, as well as any solos or licks, will come from your knowledge of the chords and how to use inversions to create interesting melodic changes. One of the most basic progressions in jazz is the ii V I progression. In the key of C this would be a progression resulting in Dm7-G7-Cmaj7. This progression has been used in too many jazz tunes to name and must be considered a starting point of you’re serious about playing jazz guitar. A good way to practice is to record the progression and experiment with improvisation using the C major scale and its derivations. Comping is another essential component of jazz playing. This is actually just a fancy jazz word that means supporting a solo instrument. While the concept of comping seems simple, knowing how to do it well takes some skill. The chordal patterns you choose, combined with the rhythms you play, must complement the solo instrument. Some considerations you’ll take into account are rhythmic patterns (keep it the same or change bar to bar), chord choices (are you playing advanced voicings or keeping it simple? ), are you playing counter-melodies, or will you be leaving out the root (recommended when you’re playing with a bass player) to leave room for improvisation? Playing jazz guitar is rewarding and challenging. It promote a deeper understanding of the principles of music structure and encourages improvisational activity that will give you the skills to survive in any musical setting, but if you intend to pursue the study of jazz guitar, be prepared to set goals and put in the work necessary to meet them.